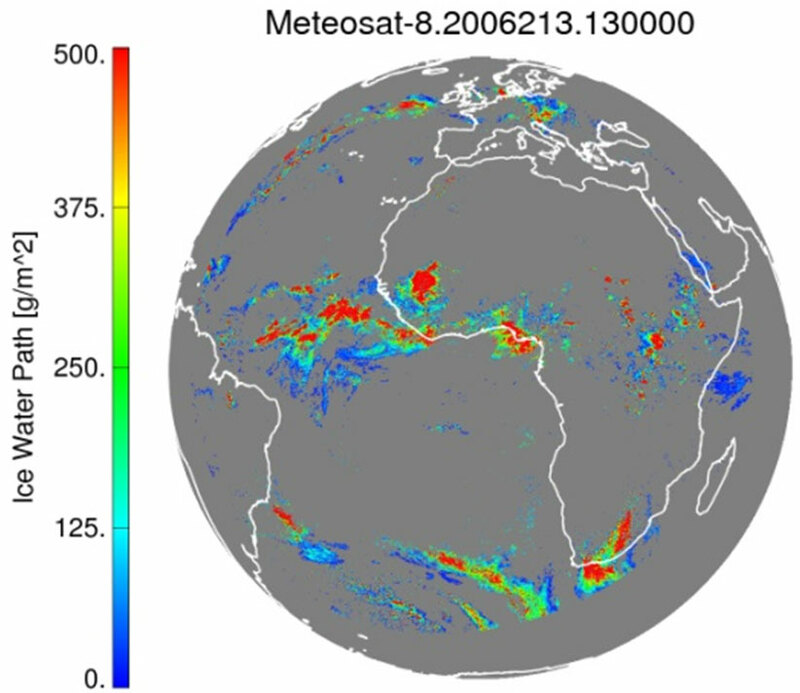 Example of the cloud ice water path (g m-2) product as generated by the ABI cloud optical and microphysical properties algorithm using Meteosat-8/SEVIRI data on August 1, 2006, at 13:00 UTC. The cloud ice water path product will be computed by using the ABI’s (0.64 µm) visible and infrared (2.25 µm) bands, together with the cloud phase, height, and particle size products, and making assumptions about the vertical distribution of cloud droplets. The cloud ice water path product will serve as a useful input to numerical weather prediction (NWP) and climate models as well as for verification of cloud parameterization schemes used or cloud output produced by these models.